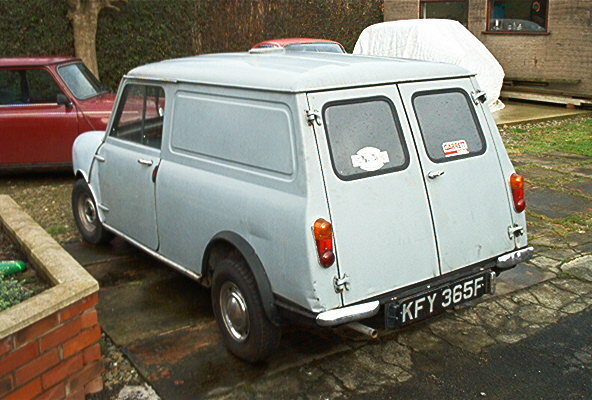 It eventually gained Historic Vehicle status, and was finally disposed of in February 2002. I was fortunate enough to become only its 3rd proud owner in 35 years. I intend to restore it to its former glory over a period of time, so keep looking for the progress! 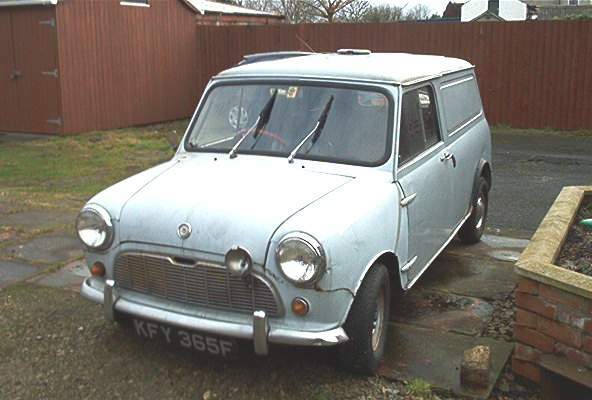 I decided that as vans are getting quite rare, I would see what was needed to put it on the road, and actually start using it as everyday transport until the Clubman Estate is ready for the road. As can be seen from the photos, it has one or two battle-scars, and a small amount of rust. It has quite recently had quite a lot of new parts fitted, such as a new petrol tank, two rear tyres, an exhaust and two new master cylinders. The rear sub-frame is also fairly new and has been painted in hammer finish - I vaguely remember the Students doing that. When I investigated the non standard grille, I was amazed to find that the original pressing behind it had not been cut away! I remember some years back, when the Motor vehicle section did some bodywork courses, that one of the lecturers and a good friend of ours, Russ Clarke, supervised the fitting of two new wings and the re-spraying of the front end. I don't recall the colour being as far out as it is now, so some fading of this front end colour must have taken place in the intervening years. I have now taken it up to my friends workshop at Plox Motors in Tarleton, Lancs. where I can get it ready for the MOT. As most of it is 30 odd years old, I felt that some parts have got to be replaced, regardless of sentiment, as reliability is a key factor, and I hate having to work on the car which I use for everyday transport. With this in mind the first job was to remove the radiator and fan to get at the water pump which was rattling its head off. The dynamo didn't sound too healthy either. It's always worth replacing all of the hoses on something this old, as the new ones seem to be of much better quality these days. Over the years, I have amassed a great number of mini spares, and had a new water pump on the shelf. The dynamo was quite straightforward, the main problem being a dry bush at the commutator end. The brushes were as new, so a light skim of the comm was all that was needed. Also evident in the pictures is the rather low front end, so whilst the radiator was out I took the opportunity to replace the top suspension arm, knuckle joint and rubber cone from bits I had collected over the years. The other side (Drivers) was also given the same treatment, which soon had the whole thing back on an even keel. The engine bay and inner wings have faired remarkably well, so I decided to give the bay a spring clean with Auto-Glym engine cleaner, followed by a good hosing off. When all was dry, a quick spray with duck oil, brought it all back to life again. The front dampers looked in fine fettle, but once removed, a different story emerged. If I held the damper by the lower section, and fully extended the upper part, it fell down to the bottom under its own weight! - that's the first time that has happened to me in over 30 years of playing with minis. Anyway, as I have said previously, I have collected stacks of stuff for minis over the years, so a very good pair were soon extracted from the toy cupboard. A pair of lower quarter valences were bought from Mini Mail and are of excellent quality - much thicker than the normal after-market ones, so a little bit of remedial work around the rear quarters will tidy it up a bit.